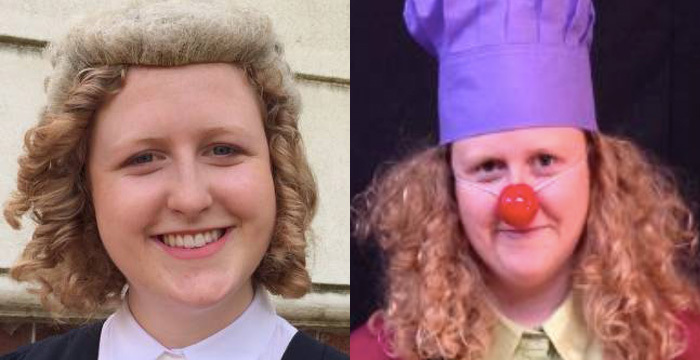 A junior solicitor has quit the legal rat race to pursue her dream of becoming a professional clown. Phoebe Mason, 26, worked as a solicitor at New Zealand law firm Atkins Holm Majurey for more than two years when the red nose and big shoes came calling. In 2016, Mason — who studied law and arts at the University of Auckland — was offered a four-month unpaid sabbatical to attend a theatre school in Melbourne, Australia. She also began acting at an improvised theatre company, ushering at local arts centre, and temping in an office. She has since gone on to create her first solo show, which debuts later this month. Mason, who describes herself as a “freelance actor and writer” on her LinkedIn profile, also applied to become a ‘clown doctor’. This involves working in partnership with medical professionals to, among other things, help lift children’s spirits during painful procedures and medical emergencies. Following a succesful audition, Mason spent time ‘clownterning’ (essentially a vac scheme for clowns) alongside veteran clowns in local hospitals. So what promoted the career switch? Speaking to New Zealand news site Stuff, Mason explained her lightbulb moment came when she asked: “What could life be like” away from law? Mason isn’t the first legal professional to venture down a very different career path. Legal Cheek has reported on lawyers becoming professional cake makers and full-time personal trainers. One lawyer even ditched the profession to do ‘The Nicest Job in Britain’. Its her life, got for her. Who are we to care? Not much difference between a solicitor and a clown in any event. We’ve all ditched law to be clowns a long time ago! Nice pinch from ROF again there Tommy, are you hustling for a raise? Someone half a planet away changes their job. It’s news. The issue here is that LC steals content from ROF and then rewords it slightly before uploading it as their own about 2 hours after publication by ROF. That is what winds people up. I don’t care. I don’t visit ROF because it is a crap platform. Why is she wearing a wig? People who quality and tend to be trial lawyers refer to themselves as barristers, and those who tend towards litigation refer to themselves as Solicitors, but it’s the same qualification and profession. How DARE this woman voluntarily move from a highly paid job to a lower paid job just because she wants to! Doesn’t she know such actions contribute to the GENDER PAY GAP! Force her to stay! The sisterhood demand it! Why didn’t she get a job on Park Square in Leeds – you can practise whilst being a clown at the same time. she’ll be good at it since the criminal law pay has been making a clown of us lawyers for way too long.